The rites of Spring… Diorissimo by Dior The Perfumed Dandy’s Scented Letter | The Perfumed Dandy. It was an idea of nature and not the thing itself she adored. She had no time for mud and weather, wild animals and running amok. Her idea was of an idealised au naturelle where plants were perfected into decorative stage set props and trees became perfumed bit part players. A world where she could glide gracefully through scented air on a swing suspended from an invisible branch, her perpetual motion made possible by a silent servant glimmering on the edge of ghostliness. How natural then that she should make her way each day in her extended late lunch hour to a room on Manchester Square, placing herself safely within walls hung with pastel silks and paintings. There, surrounded by marquetry and enamelled secretaires, just footsteps away from cabinees of fine Sevres, she contemplated copious swirls of peach pink damask, petticoats and lace. She fancied herself in a hat, with a corsage of violets tempting the eye to the edge of her over brimming décolletage. She flushed at the thought of flattering glances stolen by a man looking on from an unfortunate angle and forced out a feigned blush at the suggestion of the inevitable animal advances to follow. Day dreaming of throwing silk slippers and caution to the wind, the imagined breeze brings the fragrance of an illusionary forest floor to her: jasmine, ylang ylang, boronia, lilacs and everywhere muguets. The Lily of the Valley it is said was born of Eve’s tears as she departed disgraced from the Garden of Eden. Yet this woman, sat alone in the distant splendour of a stately home turned picture gallery, has never even entered paradise. A golden clock in the shape of a sphinx chimes in another room not far off and even her extended hour is over. Careful not to let the guard to see, she scribbles her telephone number on a scrap of paper and reapplies her perfume. Renewed, as always, by her midday encounter, she is still surprised to find that it is now Spring outside. Buoyed up by the sunshine and the burgeoning hope of a change of seasons and fortunes, this time she lets the note slip from her hand as she walks past the man planting out small flowers that look like snow drops. She will carry those same flowers one day, in a bouquet, arm in arm with him. Diorissomo by Dior is one of the most discretely but decidedly sexual of all scents. 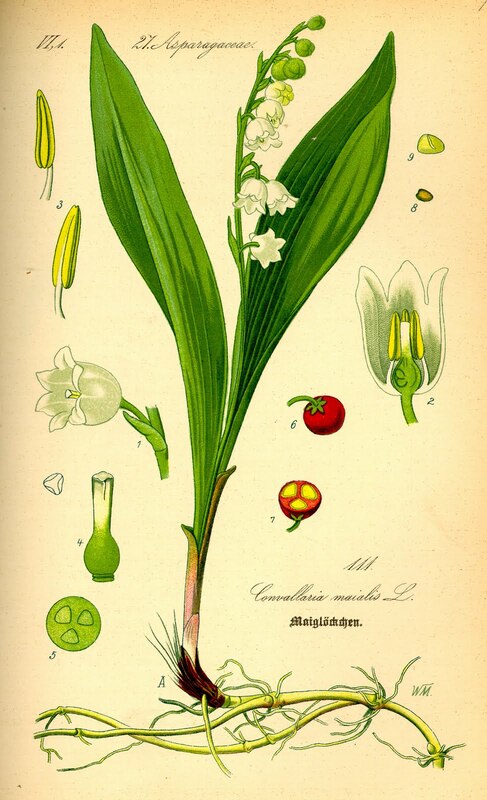 It is a great mass of aldehydic muguet, the parfumeurs’ sleight of hand for the seemingly innocent Lily of the Valley. But like the flower carried by wealthy brides on their wedding day, this scent conceals deeper and more animal pleasures beneath its surface of propriety and cleanliness. A lasting tonal green escorts the fragrance through from a brief citrus opening to a floral heart that contains the signature note supported by lilacs, jasmine and aromatic rosemary. This being no tended flower garden but a wild forest floor, there are also aromas of wood and animals in amongst the undergrowth that hint at altogether darker pastimes. This scent is a work of both art and artifice capturing the corseted sexuality of a swoon to absolute perfection, smelling salts and all. However, beware, for Diorissimo is not for the faint of hearted, more for those prepared to lose their hearts. It is the smell of lovers. It must be admitted that to many the muguet is a quintessentially feminine scent and as such many men would find it hard to even consider wearing this perfume. I am not one of those men. I enjoy Lilly of the Valley scents, most of all in the morning, and would be happy to awake to find Diorissimo in my bed. Delicious, exquisite! Diorissimo unveiled! Beautiful elegance indeed. The whole scenario and descriptive makes me want to go get a bottle this very instant and douse myself in it! Diorissimo is indeed delicious and exquisite and I thoroughly enjoyed my day in her beautifully elegant company. She currently resides at the very top of the Dandy’s wish list. Gorgeous review! The Fragonard painting is the perfect image–so elaborately formal in dress, so romantic in attitude, so naughty underneath. Brilliant. Knowing that this review would be published today I went to see the Fragonard ‘in the flesh’ as it were. Surrounded by all the very bountiful Boucher’s and those women with their eyes turned skyward in pictures by Greuze ‘The Swing’ seemed almost tame… almost. Such a joy on one of the first sunny days of the year too. Love that mad Fragonard and her weird impossible legs! So fitting for Diorissimo which is one of the few Lily of the Valley perfumes I quite like. As you say – an idea of nature since it’s a synthetic note you can’t make a natural extract from. It’s rounded out in Diorissimo in a way that doesn’t hurt my head, though it’s quite a loud statement for such a modest flower, thankfully they didn’t add tuberose (always smells like petrol to me) that would have destroyed it. These reviews are great Sir Dandy, so uplifting, are you going to make a book collection in the future? You could be sponsored by perfume companies and add a tiny bubble of perfume at the top of each review so readers can dab a spot on their wrists and really go on an olfactory/literary journey. I’d love that, I imagine other people would too! I’m so glad that you are enjoying reading the reviews quite as much as I am writing them! Yes, to what Rose said! It’s too hot for lily of the valley here but I remember banks of it growing in London gardens… If you stepped outside right now here in LA you’d smell jasmine on a unseasonably warm breeze (and maybe a little petroleum distillate). Loved this portrait of Diorissmo. Thank you so much – Diorissimo might just be the only Lily of Valley that could stand the heat, it has a steely backbone of Jasmine that gives it a robust nature that belies her seemingly winsome ways. Oh how The Dandy wishes for your weather now. What a lovely, romantic review! I adore lily of the valley. We had the blossoms in May where we used to live…nothing compares to the scent and charm of the live blossom! I miss them so much. Doirissimo is such a beautiful perfume. Older vintage is better, of course. I miss that, too! I do find both the perfume and the picture romantic – though in a quite knowing and rather naughty way!! So Diorissimo’s story is sin and redemption? That’s awesome! 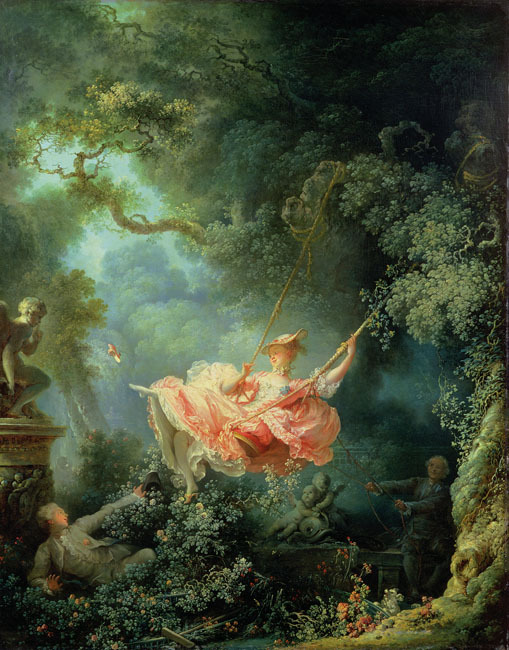 I love the image of the woman in the black backless dress as much as the Fragonard. I can’t recall in great detail what Diorissimo smells like. But your letter gives me a good idea. Diorissimo smells about as deliciously deviant as a Lily oof the Valley can get – I would encourage you to give her a go, though I have read that gentlemen’s noses are more attuned to the fragrance than ladies’. What a splendid review. It felt like one could step into that room and smell the,not so innocent, lily of the valley in the air. Dare I say you are almost psychic because I may be one of the few who actually does own a gilded clock flanked by a pair of winged sphinxes, although mine does not chime. We are all in agreement that your tales are worthy of a thick coffee table book with glossy pictures that make the perfumes come to life and scented pages as to draw us ever closer. Not so innocent at all! Now why does it not surprise The Dandy to hear that you have a timepiece guarded over by golden sphinxes… the only shock is that it does not chime, perhaps a tune could be added to it, what a splendid thought. Love the Fragonard….used to spend hours in the Frick museum staring at the Fragonards…indeed Diorissimo is the quintessential springtime fragrance! The Dandy shall be in New York in May and will almost certainly wil find himself at The Frick, the excitement rises already. When in May? did you know that the lovely Olfactoria will be there at the end of May? I expect it is to New Yorkers much what the Wallace Collection is to we Londoners or the Musée Jacquemart-André to Parisians. My mother used to wear Diorissimo a while ago, when I was still young and living with my parents. Old enough, to remember how I started to wear it myself and learned to love it’s sweetness. Diorissimo is a unusual lilly of the valley, it’s metal end makes it refreshing, almost moisturising with a naughty twist. Thank you for bringing back dear memories! It’s the Dandy’s very pleasure to have helped recover those precious memories..
You are so right, there is a sort of metallic shine that runs through this Lily of the Valley, a salacious chrome that that is both functional and sexual at the same time. I have been very drawn to this scent in recent months. When I first smelt it, I got a distinct image of a spoilt rich girl, curly hair, in a little white party dress and ankle socks sitting on a chair, kicking the legs of it in a sulk. A few years on and I can see her riding horses, sloping around in jodphurs at the gymkhanas, sipping pimms whilst gustily laughing in a crowd. It is such a perfume for the ‘debs’. I have grown to love this one. Thank you for your marvellous review. Your description of ‘a perfume for debs’ has The Dandy laughing for we all know what a knowing breed they were… and that at the end of the day were they not all after one thing…. Reading your blog was a great way to start my day … Thank you! Welcome to The Dandy’s please do make yourself at home. I hope you will start many other days this way! It’s been the May Day Holiday this weekend and today here in Britain. The weather has changed and Spring is very much in full season. No perfume does as well in these conditions it seems to The Dandy as Diorissimo! I tried this recently and thought it wonderful. No gimmicks, it’s how a classic perfume ought to smell. The Sales Assistant told me Princess Diana wore this on her ill fated wedding day. It made me think of melancholy angels. I have heard that story to.. certainly there is a sense of lost innocence about this scent. A play between the near purity of the muguet and the dark greens and animalics present in the background. Nice to read this one again, Mr. Dandy. I always enjoyed Diorissimo most in the late days of winter when I was absolutely *pining* for Spring. I never considered its sexiness before, but I have reconsidered it now. Or maybe it’s just your persuasive writing. I hope you’ve been enjoying the long weekend. Very best regards. ~~~L. The perfume is indeed stunning, and I find exceedingly wearable. Though. not being in the first flush of youth, The Dandy does worry that he might be mutton perfumed as lamb!! No. You wouldn’t wear it if you couldn’t carry it off. Your skin must be right for it. I once found a vintage parfum de toilette of Anais Anais (divine, with extra gravitas) and wore it out while shopping (good lord how camp that last sentence sounds). I smelled ludicrous. Me in lilies? I can wear the sweetest things on earth convincingly, but pristine petals fade in microseconds. I envy your chaste epiderms. 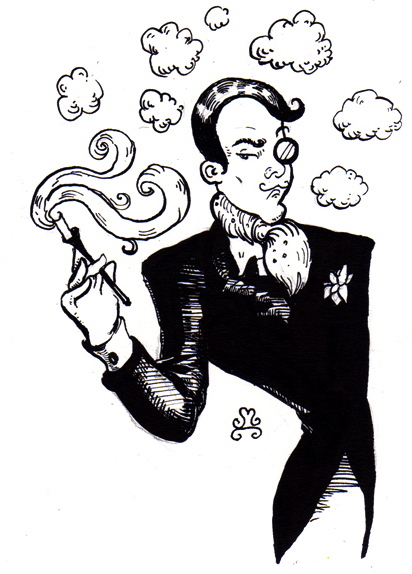 And The Dandy envies your ability to be all sugar coated without being cloying. Dior’s Mitzah which I always think smells divine on everyone else is pure, admittedly high quality, toffee apples on me.